"One of Those Happy Stories!" "Life as A Chiari Parent...What They Don't Tell You"
Although it is estimated that Chiari affects about 300,000 people in the US, it is not known how many children are affected. Up to 30% of children born with Spina Bifida also have Chiari. 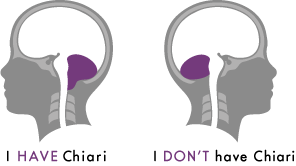 Trouble swallowing is one of the most common symptoms in young children with Chiari, which can lead to growth problems. 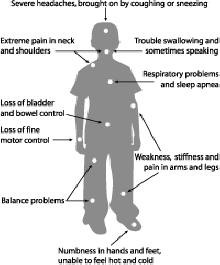 Older children with Chiari often have scoliosis, an abnormal curvature of the spine. The cognitive, emotional, behavioral, and developmental effects of Chiari have not been studied extensively, and are not well understood. There have been reports of sudden death related to Chiari, for example due to respiratory issues, but it is not clear how often this occurs. Has your child been diagnosed with Chiari? Ollie's story- Oliver was a perfectly healthy 10 month old baby. All of the sudden in May he started getting really fussy would crawl or cruise anymore. In June he started to get worse, crying all the time and when he wasn't crying he was sleeping for 30 min at a time 23 hours a day. When he was awake he would cry in my lap or just lay there. I took him to three different doctors. First said he's teething and some babies are just grumpy, second virus, third ear infection. He was 10 months and he couldn't eat food at all without puking or gagging. He could no longer nurse without gagging. He finished his antibiotic for the ear infection and he was still so wobbly and just sick. I was like screw it there is something wrong, so I took him to the emergency room. The first emergency room said they were very concerned with his symptoms and his breathing (because it had been slow). They sent us via ambulance to UK pediatric hospital. There they did an EEG and found nothing. Then finally after 4 days there they sedated him for his MRI and spinal tap. After that they came in the recovery room and told us he had Chiari but it wasn't what was causing his symptoms. But they were sending us to the PICU because his breathing was only getting worse. We get to the PICU 20 minutes later. The doctor there said he didn't understand why we were there and he was going to send us back down to the floor. 10min later they were putting him on a ventilator because the spinal tap had caused problems with the Chiari. The immediately sent us to Cincinnati Children's Hospital via helicopter. He stayed on life support for 3 days when the finally weened him off. His official diagnosis was: Complex Chiari Malformation, hydrocephalus, and basilar invagination. July 2nd Dr. Vadivelu did his decompression surgery. It went great and we got to go home 4 days later after 2 weeks in the hospital. He is so much happier and smiling all the time now. AND LOVES food now. He will continue with speech and physical therapy. He will be in his neck brace for a year (till he is 2) and have another surgery for the basilar invagination. But for now, he is happier. A positive parent-school relationship is critical when a child has a disability or health condition like Chiari. Wintertime can be difficult for people who suffer from chronic illness. Check out our new section on Staying Positive, which can be beneficial to your physical and mental health. 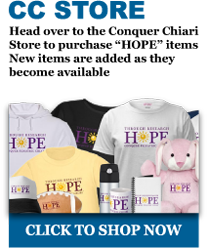 Are you a child that wants to help Conquer Chiari? A parent of a Chiari child that wants to get involved? Here is your chance. Conquer Chiari would like to open a section in our online store: "Kids Can Conquer Too". Submitted designs will be prepared for printing and placed into our online store. If we use your design, we will send you a FREE T-SHIRT with your design on it.